Crystal clear and comfortable. Sometimes the pool feels like you are swimming in a teardrop. The spa, very clean and no nasty chlorine smell. Need a timer? check! How bout a cover? Check... All round fantastic service with the prices that are kept low, because of low overhead, I suppose. I mean, these guys don't wear shoes, they are Barefoot! Since Barefoot Pool Service has had our account we have had ZERO, that's ZERO problems. If you are looking for a company you can trust, with reasonable rates and a complete understanding of what Customer Service is all about. Check em out. Remember how good no surprises feels.. 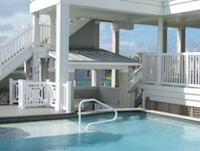 Need Pool Services in the Outer Banks of North Carolina?? So did I and man did they come through. I got a call that my pool pump motor was not working. I had called around and got quotes to fix it, but it would take a few days. I made one phone call to barefoot pool service and they replaced the pump motor the same day!! I had a real emergency and the level of professionalism put all my fears to rest. I can not recommend them enough. Thanks for the kind words. We are all ways here to help!